From televisions in every room to smartphone room keys, the hotel industry has evolved to stay at least on pace with travelers, if not a step or two ahead. Now, challenged by the home-sharing economy — Airbnb alone reported over $1 billion in revenue in the third quarter of 2018, its highest to date — new hotels are toying with everything from pricing to privacy. The following three new hotels embody some of those experiments. Beyond providing the convenience of having someone else make your bed and launder your towels, can a hotel room improve your mood? That’s the question posed to guests of the new Angad Arts Hotel in St. Louis. The 146-room hotel, which opened in November, offers four color schemes designed to support emotions. Rooms come in yellow, said to be associated with happiness, green for rejuvenation, blue for tranquillity and red for passion (doubles from $185). Rooms come with corresponding accessories, including a tabletop Zen garden with a mini rake in the blue rooms, a lamp set with Himalayan salt crystals in the green rooms, a smiley whoopee cushion in the yellow rooms and a scented candle in the red rooms. In December, I booked a yellow room to test the effect, reasoning that anyone staying solo on a business trip could use a boost of happiness. My room glowed with warmth, from the yellow rubber duck in the bathroom to the overhead ductwork, also painted yellow. The morning sunlight streaming in only heightened the effect, making it just too impossibly bright and, yes, cheerful, to sleep past 8 a.m. 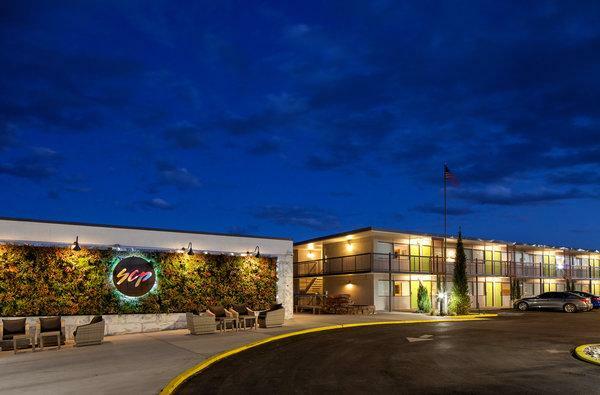 The new SCP Hotels stands for “soul, community, planet,” with the aim to operate sustainably and nurture connections between guests. Its first location, which opened in June in Colorado Springs, Colo., introduced a key component of its intended transparency with what it calls “fair trade pricing.” It allows guests to name their rate when checking out, meaning they can lower the suggested price if they feel the value doesn’t align. That experience relies on wellness, with a multifaceted, 12,000-square-foot fitness center that includes a cross-fit studio, climbing wall and group classes in yoga and Pilates. Its 174 rooms have a rustic quality, with barn-style sliding doors and reclaimed wood from trees that had been damaged by invasive beetles. A store stocks local coffee, beer and healthy snacks, and communal tables and free Wi-Fi in the plant-filled lobby are designed to encourage co-working. A renovation of a derelict Knight’s Inn, SCP suggests rates from about $100 to $200, depending on the season. The name-your-rate strategy aims to entice travelers to take a chance on a new brand. “This is a means of taking risk out of that decision point of consumers to give us a shot,” Mr. Cruse said. Though the policy sounds ripe for abuse, so far no one has lowballed the rates, he added. He hopes it will solicit feedback from guests, and says the hotel will honor a request to reduce the rate, such as a noise complaint, and not just negotiate a discount. SCP has only the one hotel in Colorado Springs and aims to open 30 to 40 more throughout the United States in the next three years. Opened in November, the Bode hotel in Nashville is designed to mimic the group-friendly features of home shares, including multi-bedroom units with kitchens, while adding traditional hotel amenities, such as bars in the lobby (rooms from about $260). The company based the Bode model on its founders’ love of group travel with family and friends, and dissatisfaction with socializing in a hotel and searching for a stylish, well-located home to share. Instead, Bode offers condo-like units of up to five bedrooms with living areas and kitchens. Guests have the convenience of hotel housekeeping, a concierge to point them to local restaurants and public social space, including a bar with coffee and pastries in the morning and alcoholic drinks and charcuterie plates later on. A market sells basic groceries, beer and wine. Outdoors, there are firepits, games like Ping-Pong and a stage for live music. The group chose Nashville for its first location for its attraction as a concert, festival and convention destination. Future plans include openings in Palm Springs and Orange County, Calif., and Chattanooga, Tenn., where it aims to appeal to the family market.